At noon yesterday, more than 160 Oscar nominees attended a special Academy Awards luncheon, an annual event called “Nominees Luncheon” at the Beverly Hilton in Beverly Hills. 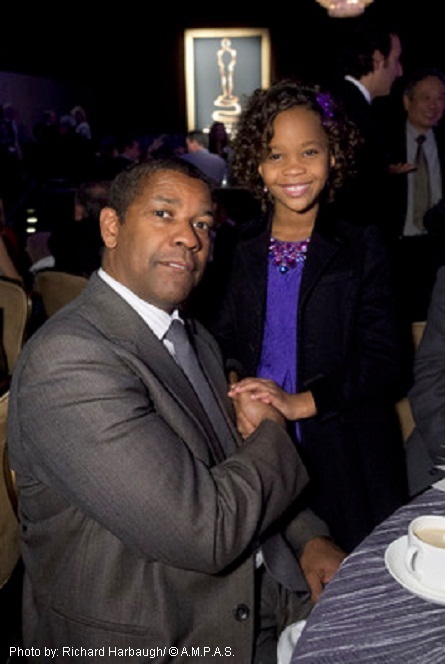 Among the super-stars rubbing elbows were Robert DeNiro, Steven Spielberg, Denzel Washington and seventeen of the 20 nominees in the acting categories. The Lead Actresses and Actors that were there included: Jessica Chastain, Jennifer Lawrence, Quvenzhané Wallis, Naomi Watts, Bradley Cooper, Daniel Day-Lewis, Hugh Jackman, Joaquin Phoenix, and Denzel Washington. Representing the Supporting Actor and Actress categories were: Robert De Niro, Tommy Lee Jones, Christoph Waltz, Amy Adams, Sally Field, Anne Hathaway, Helen Hunt and Jacki Weaver. Four of the five nominees in the Directing category – Ang Lee, David O. Russell, Steven Spielberg and Benh Zeitlin – also attended. Three of the Academy’s four 2012 Governors Awards recipients, Jeffrey Katzenberg, Hal Needham and George Stevens, Jr., joined this year’s nominees. Oscars® for outstanding film achievements of 2012 will be presented on Oscar Sunday, February 24, at the Dolby Theatre™ at Hollywood & Highland Center®, and will be hosted by Seth MacFarlane live on the ABC Television Network. The Oscar presentation also will be televised live in more than 225 countries worldwide. 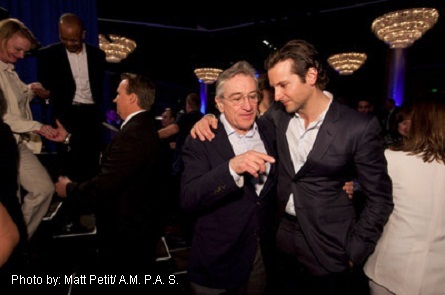 Please view photos below courtesy of The Academy of Motion Picture Arts and Sciences. 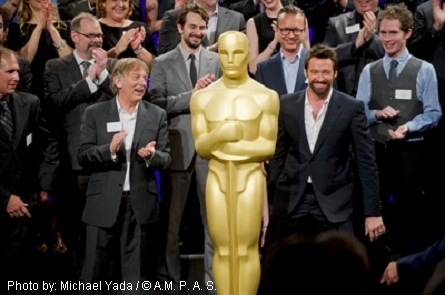 Hugh Jackman surrounded by fellow nominees. 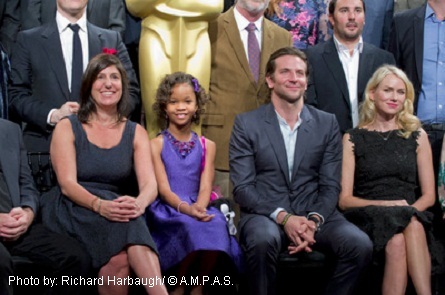 Pictured (l-r): Pilar Savone, Quvenzhane Wallis, Bradley Cooper, and Naomi Watts. 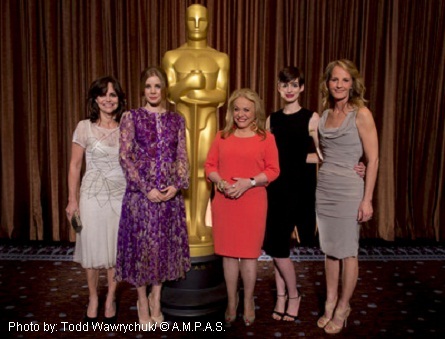 Pictured (l-r) Jessica Chastain, Amy Adams, Steven Spielberg and Sally Field. 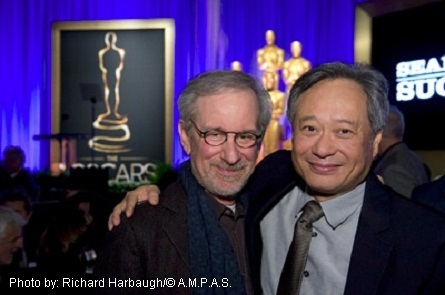 Pictured (l-r) Steven Spielberg with Ang Lee. 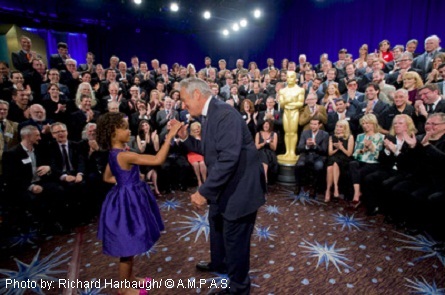 Pictured: Quvenzhane Wallis is greeted by Academy President Hawk Koch.